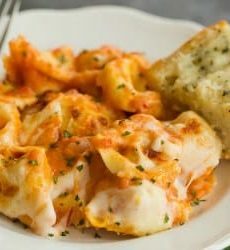 A wonderfully cheesy baked tortellini dish made with a mixture of béchamel and red sauce. Make the Béchamel Sauce: In a medium saucepan placed over medium heat, melt the butter. Add the flour and cook, whisking constantly, until the flour turns light brown and emits a nutty aroma. Slowly add the milk, whisking constantly. Once all of the milk has been incorporated, whisk in the nutmeg, and allow the mixture to come to a simmer. Once simmering, cook for 2 minutes, whisking constantly. Remove from the heat, and add the shredded provolone a handful at a time, stirring until it melts. Stir in the Parmesan cheese and season with salt and pepper, then set aside and let cool to warm room temperature. In a medium bowl, whisk together the béchamel sauce and the spaghetti sauce. In a very large bowl, combine the tortellini and three-quarters of the sauce mixture. Turn into a 9x13-inch casserole dish and spread into an even layer. Drizzle the remaining sauce over the top of the tortellini. Sprinkle the mozzarella and Parmesan cheeses evenly over the top. Cover with foil and bake for 45 minutes. Remove the foil, increase the oven temperature to 400 degrees F and bake for an additional 10 minutes or so, until the cheese is browned and bubbling on top. Allow to sit for 10 minutes before serving.